Shopping for new lights for our house has been so exciting. Light fixtures aren't the easiest home purchases to shop for, but they make such a huge statement and really complete a room. 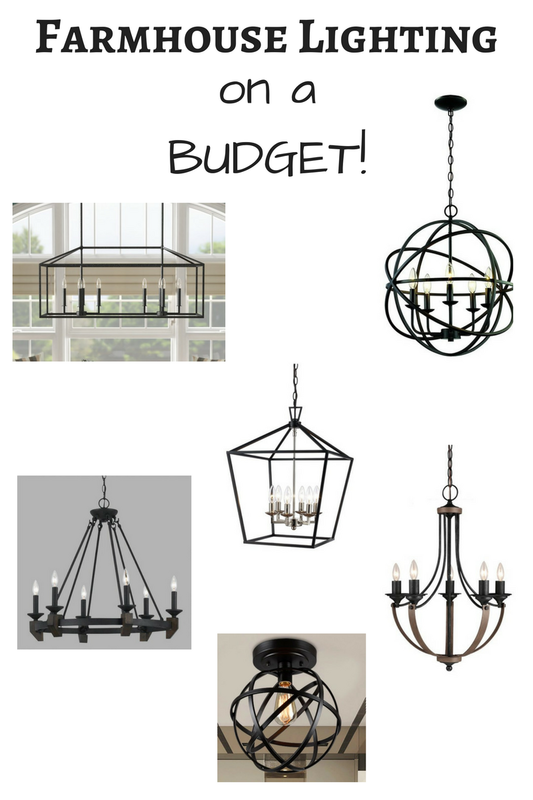 I searched and searched for the best farmhouse light fixtures that had great reviews (I always recommend reading reviews and looking at the pictures so that you can see how they look in other peoples space-this really helps me decide!) and that were budget friendly. Some of these lights I knew I wanted before we even bought our house, so I was really anxious to pull the trigger on them and get them hung! Odie 8-Light Pendant: This is my favorite house purchase so far. I bought it right away when we closed on our house because I KNEW I had to have it for our dining room. It is so sleek and gorgeous and looks far more expensive than what it is! We love how it looks when we dim the lights in it too. Hankinson 5-Light Globe Pendant: We have this beauty hanging in our stairway, which is next to our family room. It's the perfect size (not too small) and we've gotten a ton of compliments on it! Angelica 5-Light Chandelier: We got this one for our foyer and I adore it - however it's a little too small for our space (would be cute in a dining room though or a more narrow entryway) so I'm leaning towards getting THIS chandelier to replace it. 1-Light Semi Flush Mount: Perfect for a laundry room (which is where we have ours) or a bathroom! Yes, love these home updates!